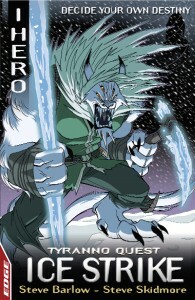 This is a brand new iHero adventure! You are a Special Forces test pilot. You are skilled in all forms of combat and weaponry and have flown prototype fighters and space ships. But now a new challenge is coming your way. Your mission: SAVE THE EARTH from the evil Starlord, Tyranno! Tyranno, the evil Starlord, plans to attack Earth with his alien armies. Your quest is to defeat Tyranno. But first YOU must battle Hurrikano, lord of Airworld, who is preparing the first strike. 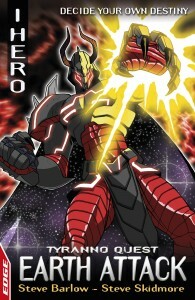 Use your high-tech DART suit to defeat Hurrikano and capture his Staff of Power before he can use it to invade Earth. Tyranno, the evil Starlord, plans to attack Earth with his alien armies. Your quest is to defeat Tyranno. 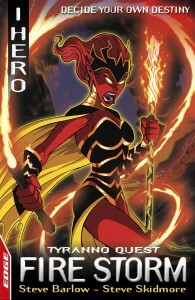 But before YOU can challenge him, you must battle Vulkana, ruler of Fireworld. Defeat Vulkana and capture her Staff of Power. Use it to upgrade your DART suit with a brand new ability! Your quest is to defeat Tyranno. 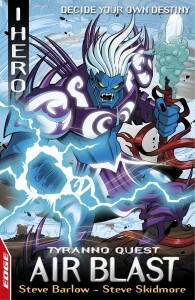 But he is sending Arktos, evil ruler of Iceworld, to attack Earth. Use your DART suit to travel across space to destroy Arktos and his alien forces. Capture his Staff of Power and use it to upgrade your DART suit. But will YOU make the right choices to get that far?